✔ EXTRA WIDE SLOTS: This toaster designed with wide long slots to easily fit thick breads such as artisan breads, bagels and buns. So do not need to worry about bread getting jammed in toaster. ✔ CANCEL, DEFROST& REHEAT FUNCTIONS WITH LED INDICATOR LIGHTS: The light is always illuminated red when in use, and automatically go out when the toasting is done. Plus, the toasting operation can be halted at anytime by pressing Stop button, then the light will go out and toasting stops. ✔ SLIDE-OUT CRUMB TRAY FOR EASY CLEANING: There is a crumb catcher attached on the bottom of the toaster that can slides out easily, making it easy to clean up the debris of the breads. ✔ HIGH LIFT FUNCTION: Once toasting is done, the lever pops up higher than normal making it easier and safer to reach small slices. 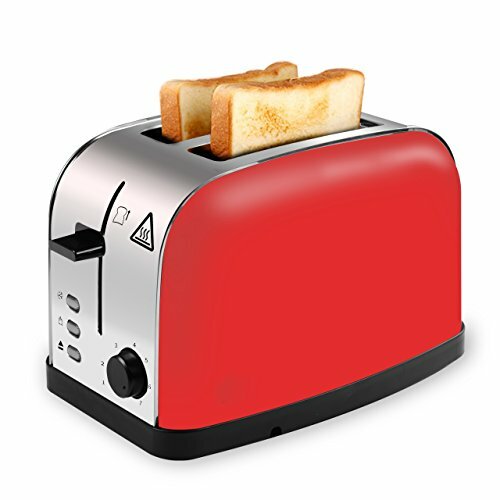 ✔ BREAD BROWNNESS CONTROL: The toaster has a control knob that can be adjusted for the amount of browning desired. The brownness setting dial goes from 1-7. Setting \'1\' is for lightest brownness and \'7\' for darkest toast.
" Makes the best toast in the world " quote from my 7 year old who is a very fussy eater.